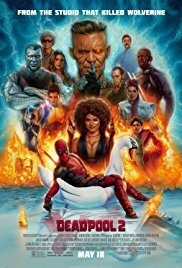 I adored Deadpool 2. It was just as funny as the first, and didn't lack in plot either. By the final scenes, I was laughing and sobbing at the same time. As always, there's plenty of crude humour, coupled with a never-ending stream of in-jokes and pop culture references--two things I love. It's worth hanging around for the credits scenes too, as they were hilarious. Ryan Reynolds isn't an actor over whom I am always in raptures, but as Wade Wilson he really delivers. Deadpool is, without a doubt, the perfect role for him. This is definitely a film I will enjoy rewatching when the DVD releases, and on the basis of this sequel, I wouldn't certainly go to see a third instalment, should they make one. I saw it this past weekend and loved it too!!! He is epic as Deadpool!! Best role ever! Ah. I've not read the comics. But that does sounds cool.